We repair or resolder broken or snapped connectors from usb drives, usb dongles, sata hard drives, ide disks. Sometimes the plugs, sockets and connectors have become detached from the circuit board or been ripped off the pcb by accident. USB dongles often control software licence and this can be a problem when the original company no longer exists, or they charge a small fortune to replace the dongle. Click for Broken Connector Repair News. Click for Snapped Connector Reviews. Broken USB and SATA drive connector repair problems that we recover data from are listed below. 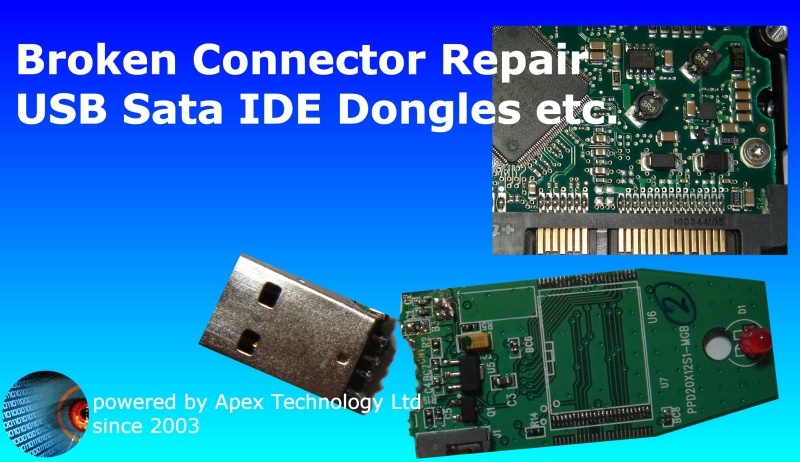 broken usb or sata connectors on dongles flash memory sticks and sata hard disk drive and hdd repair to socket or plug and resolder pins to pcb circuit board, bent pins where ide or scsi cable attached. We repair USB and SATA broken or snapped connectors. This includes USB Dongle, IDE, SCSI connectors that have become detached from the pcb circuit board..